The Pour Curator: Widmer Redesign: Craft or Commercial? 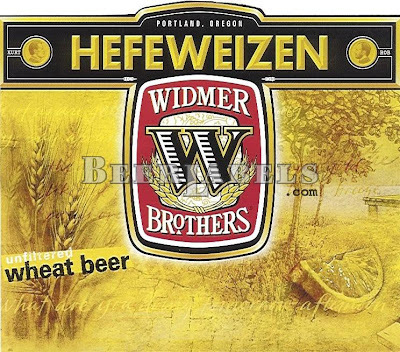 The news of Widmer's new labels came to my attention late last year from the great Jeff Alworth. It's fairly straightforward and bland. 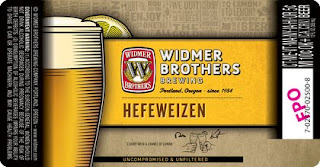 They cartooned the beer glass and added a lemon for the Hefe. The printing press-text on the background is faint and unobtrusive, and the rest is just simple bold colors. It's more modern, but not exactly special. Alworth made a comment I found interesting. "The largest loss is drifter, which was one of the truly beautiful labels out there." With all due respect to Jeff, I don't think that's all that special or beautiful. But I acknowledge that a big part of how we perceive art and design is the associations we form in our memories, so this may carry a bit more history for him than it does for me. There is an identifiable simplicity to it, but I'm surprised to hear someone that attached. It's okay, but nothing special. The new design is certainly an improvement over this. This was a bit better, I think, because it looked old-school and traditional, rather than like it was trying to be something new. In some ways, this was the best. It looks mostly like a wine label, and there's very little pretense. I think we can all agree that the new look is the closest thing to an update we've seen, and the 2-D glass on the new art is a strong element that keeps it fairly contemporary. The composition and wordy background are hardly cutting-edge (trend-wise, closer to 2001 than 2011), but they at least look crisp and fresh. I don't love the hands clinking at the bottom, because it feels forced to have a sort of handcrafted look in a tiny space at the bottom of what is an obviously sleek and advertising firm-produced label. 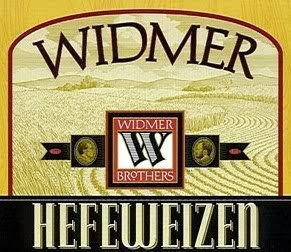 It's probably an improvement overall, but one thing it won't help is that Widmer is still spiritually on the outside (and technically, too, when it comes to definitions) for many craft beer enthusiasts, thanks to its membership in the Craft Brewers Alliance, a publicly traded conglomerate with Anheuser-Busch-InBev backing. Readers of this blog know that I'm all about making smart business decisions, but this seems aimed more at suits than craft beer drinkers. 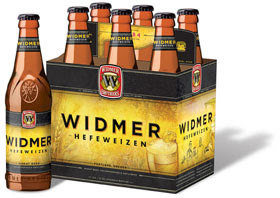 For those who see craft beer as a way of life as much as ingredients or finances, this clean but ultimately lifeless redesign will only confirm the feeling that Widmer is more corporate than craft. And, with this news that the Craft Brewers Alliance is broke, that's probably not what they are shooting for.